2nd Tuesday of the Month - all year! Every month - that is 12 times per annum - the little village of Ashby Folville in North-East Leicestershire, hosts a massive car meeting - classics, vintage, motorbikes, supercars, sports cars, modified and Japanese Imports are all represented. It is without doubt a great gathering. During the summer months in-excess of 4000 people descend, to view hundreds of show cars. If you can get there do - the event is every 2nd Tuesday of the month, but be warned.... it gets busy! After the gorgeous Spring evening back in May the weather was looking good again for June's gathering at Ashby Folville (NE Leicestershire), but alas the vagaries of British weather and the guesswork forecasting of the professionals saw the clouds come over, resulting in a steady downpour for virtually the entire day. "Cloudy with long periods of sunshine" Hmmmm our forecasters seem as bad as ever. 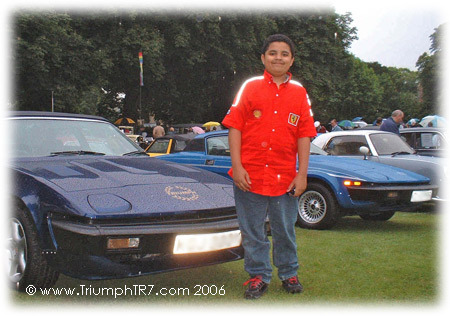 In May it was only TRickett (1981 Solihull Triumph TR7 DHC) who went along from our stable of cars that could be classed as show cars (obviously there's TRisha and we also have a Japanese import in the Mitsubishi FTO Mivec). TRickett, having arrived just a week earlier was still on his French plates, and with the co-pilot away on business I could only take the one car and TRisha TR (1976 Speke built Triumph TR7 FHC) was over in Coventry for an MOT and some known issues being sorted. 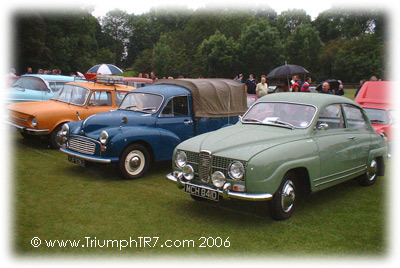 So into June and This time, with the co-pilot in the UK, both TRisha & Trickett were taken to the gathering of Classic Cars, and 'interesting' vehicles; taking both cars was slightly Harold & Hilda but hey so what? 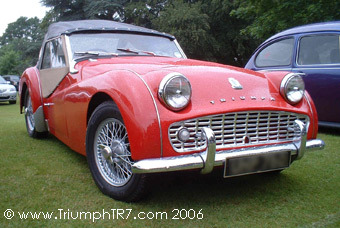 TRickett was now back on his original UK registration and also getting properly wet for the first time in a few years. With the inclement weather we didn't expect such a turnout but we were pleasantly surprised. Sure - arriving at around 18:15 - numbers were down, leading to 'normal' cars being allowed into the show field but the cars kept arriving and the numbers crept up. then realised that the newest of them was about 16yrs old, and thus probably justified it's inclusion - maybe it's because there's so many of them around still that I don't consider it worthy of being at these shows!
. And confirmed that he had indeed needed the recovery services. We had a good chat - mainly about what a joy 'proper cars' were; his car was a splendid example, just a shame that his TVR was surrounded by more mundane vehicles - a late arrival meanthe was surrounded by the early 'normal' cars.
. "yes because BL were going through a bad time weren't they?" was Ben's comment! Obviously he does his research and knows his cars and it was great to see someone so young who was genuinely interested in the vehicles at the gathering. .. this is monthly, on the 2nd Tuesday, so get down there! See some more pics here!